Last week, Fresh Water announced managing editor Erin O'Brien's departure. In this effort, O'Brien bids readers farewell with a good long walk along an offbeat path — one she offers as a stand in as locals eagerly await the completion of the four-phase Towpath Trail extension. Stand at the Ohio & Erie Canalway's Harvard Road trailhead next to the hulking Arconic plant (formerly Alcoa) and face north. Stretching out behind you are some 90 miles of nearly continuous all-purpose trail that winds all the way down to Tuscarawas County. And while that path is home to a veritable advent calendar of discoveries, the five miles before you are an adventure on their own. Start the journey like any other by putting one foot in front of the other and head west on Harvard Avenue to Jennings Road, where you will head north. 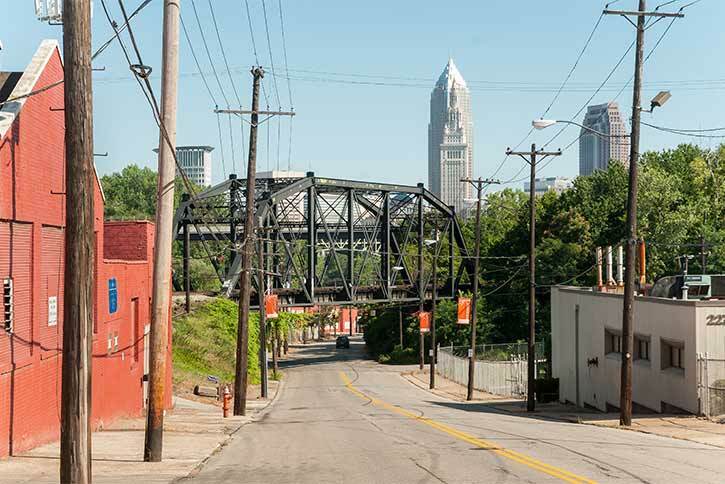 This first leg of the trek, about three-quarters of a mile, looks a lot like what snooty New Yorkers think all of Cleveland looks like: gray and industrial with a smattering of rough n' tumble bars. Chain link fences frame factories that loom across the horizon. Rusty cars line crumbling concrete and asphalt parking lots around stocky buildings with few windows. 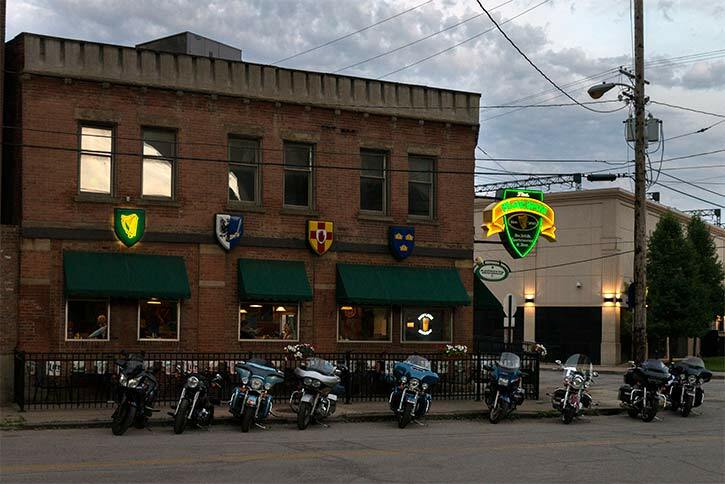 Some call this section of town a "no man's land." In reality, it symbolizes all of us. After you traverse a thrilling pedestrian tunnel, the trail eventually deposits you onto Quigley Road, which not so many decades ago was infamous for illegal street racing. While the errant speedsters are long gone, the breathtaking views of ArcelorMittal's active mill remain. And you will indeed take a few breaths as you head west up the hill. Depending on your fitness level and the weather, perspiration will sluice down your back by the time you reach West 14th Street. The walk north on this road is unremarkable at first blush. Those with a keen eye, however, will see volumes. First notice the humble beauty of the old-stock residential architecture all around you. Secondly, note how Interstate 71 amputated this solid Cleveland neighborhood. Lovely streets such as Rowley and Buhrer and Holmden were unceremoniously bisected with only one tenuous footbridge traversing the highway to maintain a neighborhood connection — some consolation prize. And for those who have never walked across a highway footbridge, take the opportunity with a quick a side trip and experience the vertiginous tightrope walk first hand along the Buhrer Avenue span. Now imagine how that changed the daily trek to Buhrer Elementary School for the kids who lived on the east side of the freeway. Our interstate freeways, incidentally, changed a lot of things. Look at a map and figure out your own tour of Tremont en route from 14th to Scranton. No matter which way you go, this tiny grid of streets is full up with historic architecture, beautiful churches and small business retail that stands in stark contrast to the offerings of Steelyard. Incidentally, this is a five-mile walk one way. So if you were going to opt for lunch, could there be anything more appropriate than a plate of Grumpy's Walker Hash? Also: A cookie and a Cupcake carries Churned ice cream — try the brown butter with lavender brittle (resistance is futile). Scranton will lead you into the belly of the Flats and there is no better way to begin navigating this iconic section of the city than via the Scranton Flats, a green patch that hugs the Cuyahoga — and to say this area was not always green might constitute the understatement of the year. Save the northern route along Scranton Flats for another day. Instead head south, up the incline, while you take in the 1957 Norfolk Southern Cuyahoga River Bridge looming on your left. Go right at the fork in the trail (you're on the Lake Link Trail, by the way, or, formally, the Cleveland Foundation Centennial Trail) and over the two pedestrian bridges, which were constructed in 2015 and give you a completely unique view of the stoic Guardians of Transportation as they stand watch over the 1927 Hope Memorial Bridge. When you reach the trail's end at the intersection of Franklin Avenue and Columbus Road, turn right and walk over the 1940 Columbus Road Bridge even if you have a devastating fear of lift bridges that dates back to when you were a tiny tot in the 70's and your dad told you a story about a bum that crawled into the works of the 1956 Iron Curtain, passed out cold, and failed to hear the signal horn indicting the bridge was going up — which it did and promptly severed his legs, thereby establishing all lift bridges as real life dinosaurs that ate your legs. In such a case, walk really fast. Continue north on Columbus and admire the vintage industrial buildings that remain while you imagine what this place looked like back in the bustling early 1920s. No matter which way you look, the vision is fascinating, but do nod to the Flats Industrial Railroad Bridge, which is frozen in its highest position, as you stroll by. When the road comes to a tee, you've finally gotten to Center Street. Go left, under the RTA Red Line tracks, past the Flat Iron Café (est. 1910 — and no one would judge you for dropping in for a pint), under the 1918 Detroit-Superior (Veterans Memorial) Bridge and traverse the rare and historic 1901 Center Street Swing Bridge (which does not eat legs, but is suspect just the same). On the other side is old Detroit Road. Turn left and head directly towards that dead end. On your right, between the two buildings that make up the posh and trendy Stonebridge Waterfront apartments, you will spy one of the graceful stone arches of what remains of the Superior Viaduct bridge, which is a fascinating and historic relic that's been part of the Flats landscape since 1878. You'll also see a sign announcing the "Cleveland Foundation Centennial Trail Lake Link." The next scant half-mile will inflate any avid Clevelander, historian or walker with pure joy. In addition to stepping through the arch of the old viaduct, you'll also walk beneath the giant blue steel trellis that is the underbelly of the Cleveland Memorial Shoreway, a span that was built by no less than 10,000 Works Projects Administration (WPA) workers in the early 1930s. Tunnels and underpasses, ancient stone abutments and industrial sights both modern and vintage line the path. A sign on Mulberry's promises award winning pizza for $5 a slice on one side of the trail, while volleyball courts with their thick sand carpet invite bare feet on the other. The trail holds mysteries such as a massive old vessel (water tower?) that seems to have died a sudden death. It lies on its side, its metal legs jutting straight out in some industrial rigor mortis pose. You emerge from the trail near the conclusion of West 25th Street and the intersection of River and Mulberry Roads. Across the way sits a public housing complex. Lakeview Terrace was part of the Public Works Administration's first national public housing campaigns in the 1930s. Across the street from that historic complex, the city submits to piles of rock, rumbling trucks and dust generated by Ontario Stone Corporation. This desolate and surreal stretch feels a world away from the hipsters savoring Malted Maple Royale milkshakes and pimento cheese at Punch Bowl Social. In reality, those festivities are unfurling just a couple thousand feet away. But don't leave this secret corner of the city just yet. 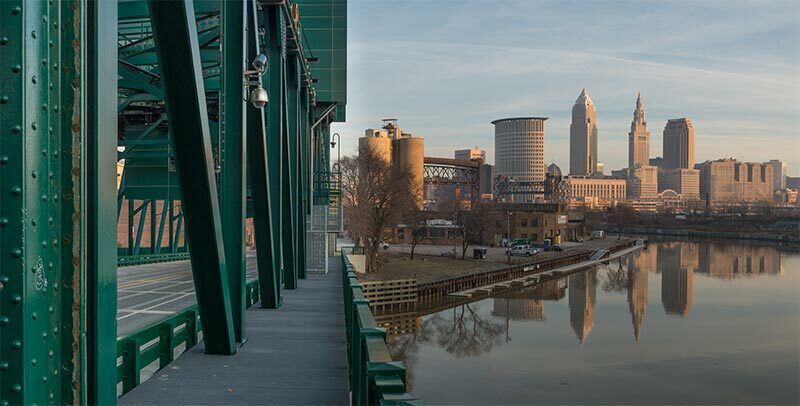 Go ahead and walk along River Road to the majestic 1964 Willow Bridge, which spans the original mouth of the Cuyahoga now known as the Old River. (The straightened mouth that flows beneath the Iron Curtain near the old Coast Guard Station was dug in 1827). 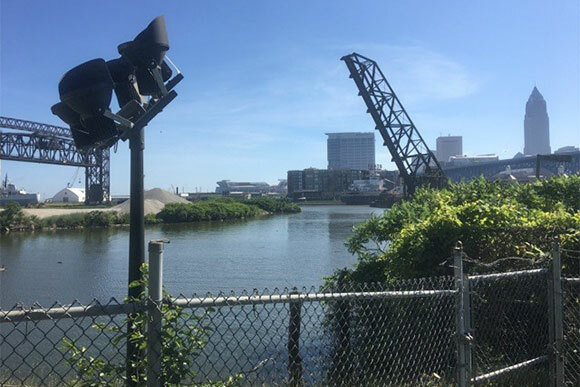 Old River, Mother Nature's original route for the Cuyahoga, has been relegated to the body of water that delineates Whiskey Island, which, incidentally, is really a peninsula. Some 200 years ago it was also home to Cleveland's Irish immigrants, who were the primary workforce in the digging of the river's re-channeling. Now then Pilgrim, step across the Willow lift bridge (and go really, really fast because it's longer and way scarier than the Columbus bridge). On the other side, sigh relief. Your feet are now on Whiskey Island proper, but its lush green charms are on the other side of a host of definitive railroad tracks and beyond your reach, at least for now. You are here like the Mohawk and Seneca Indians in their canoes, the sweating Irishmen with their shovels and the operators atop the buckets of the massive Hulett ore unloaders. Now stand tall next to the ghost of Lorenzo Carter and breathe deeply before this crooked river and marvel over its connection to the single greatest source of fresh water on this, our sweet fragile earth.